Chris Brown’s New Girlfriend in 2017: Who Is Chris Brown Dating? 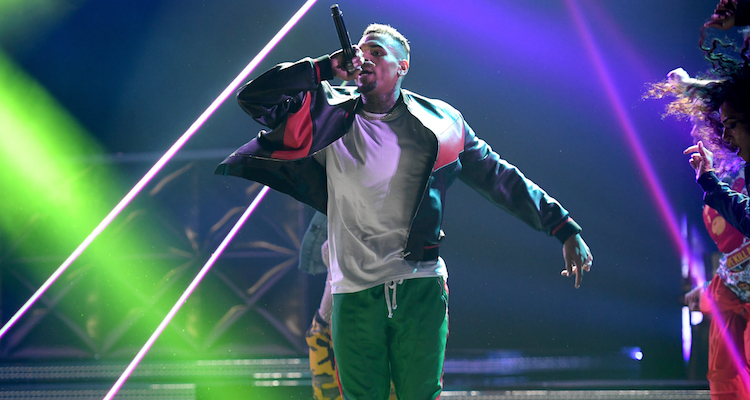 Who is Chris Brown dating? The artist and paparazzi bad boy has a new album, Heartbreak on a Full Moon, which drops on Halloween (October 31), and with a tour in the works, he’s got a lot going on. But whenever Chris Brown is brought up, the obvious question is: Who is he dating? Who is Chris Brown’s girlfriend in 2017? We’re going to take a brief look at the loves of Chris Brown’s life and see if we might be able to track down who the woman is. We’ll start with the most famous of Brown’s relationships. He and the “Umbrella” songstress first hooked up in 2007 and seemed inseparable until the 2009 Grammys, where Rihanna didn’t make it to the show after Brown assaulted her. This would lead a number of trips to court for Brown, as well having a number of sponsorships, commercial ventures, and awards shows drop him. Despite everything that happened, the couple would date for a second round from October 2012 to March 2013. This time, the relationship ended under much less public circumstances. Karrueche Tran was a stylist who became a model and actress. She first met Brown on the job as a stylist. The two hit it off and dated on and off for years. The first time they broke up reportedly had everything to do with Brown getting back together with Rihanna. After Rihanna and Brown broke up again, Tran went back in. In fact, while they are said to have gotten back together in April 2014 with an end date of March 2015, there is plenty of evidence via their social media accounts that the two broke up and got back together multiple times during this period. Currently, Tran has a five-year restraining order against Brown due to threats that he made toward her. While we’re not exactly certain when these two ended their relationship, one thing is for sure: They definitely hooked up at least once, as Guzman had a son, Royalty, in 2014 with Brown eventually being named the father. The revelation of Chris Brown’s baby mama caused Brown and Tran to break up. Their relationship ended with courtdates, the two fighting over visitation rights, and other issues revolving around Royalty’s upbringing. Brown and Ammika Harris, an aspiring model, hooked up after his relationship with Tran ended. There’s not really a lot to say about this one as while there was a little bit of social media drama, it was nothing compared to the storms that the other relationships brewed up. Who’s Chris Brown’s Girlfriend Now? Who’s Chris Brown new girlfriend? Does he have a girlfriend? Details on this front appear to be a little bit sketchy. As of January 2017, Brown appears to be dating Vanessa Vargas, who works as a model but, at least for the moment, the relationship is a very quiet one. There is some social media flirting but details about their relationship, or if they are actually together, are unclear.